Portsmouth is located on the south coast of the UK and is a famous naval dockyard connected with many historic battles at sea. It is also home to an influential University which includes the Faculty of Creative and Cultural Industries. Recently, this Department wanted to consolidate all its facilities on one site. The result is a new 4,600m2 building which expresses the faculty’s new identity within the University and the city. The scheme contains a café, shop, large exhibition space, seminar rooms and large lecture theatre. Open plan offices for academic and administrative staff and a post-graduate centre are located on the upper floors of the building. This new creative and cultural facility, known as the Eldon building, was designed by architects Penoyre & Prasad. 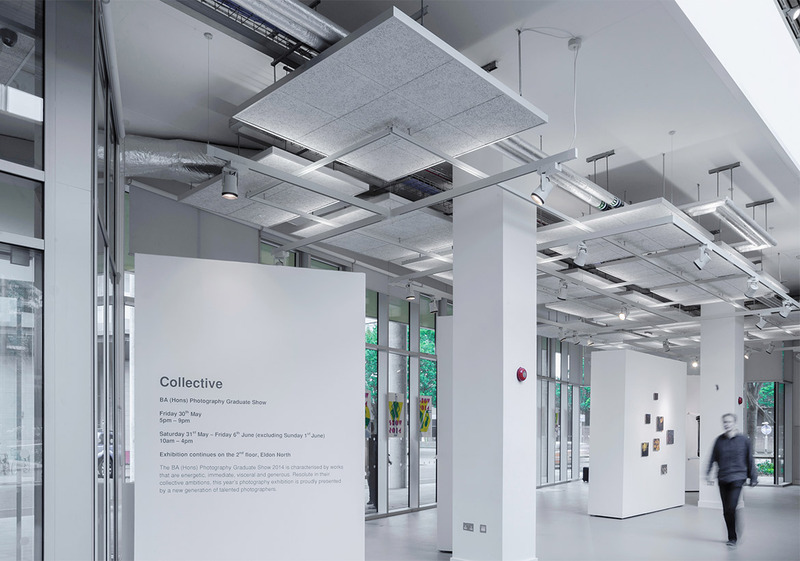 The entrance foyer, also used as an exhibition space, displays a very dramatic ceiling using Troldtekt acoustic panels. 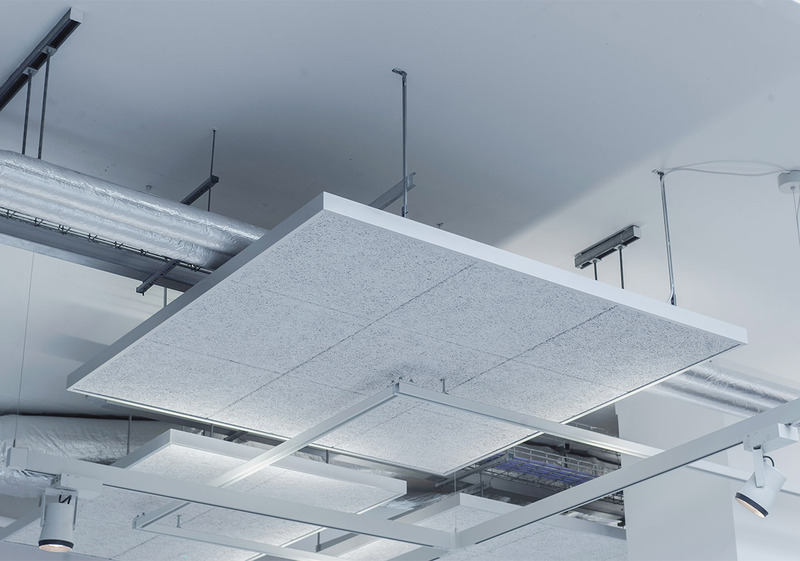 It is a very good example of how a sustainable acoustic ceiling can be used to perform several roles simultaneously. Here, the architects have combined a gridiron pattern of suspended Troldtekt acoustic panels, often known as clouds, together with a framework of lightning strips. This aesthetically pleasing arrangement gives great depth to the ceiling. 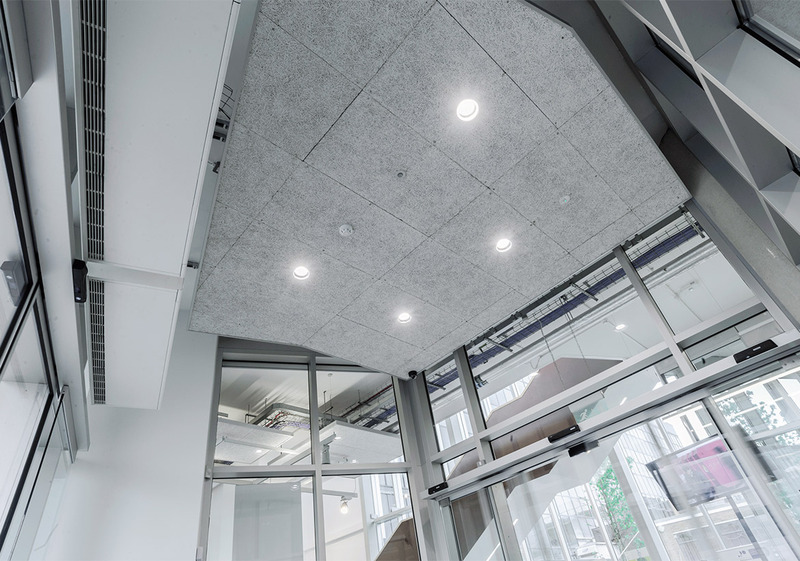 At the same time, it combines the function of dampening down echoes and noise from the continuous pedestrian traffic while providing easy access and servicing for the flexible display lighting and other services above. The high environmental ambitions for the project presented an ideal opportunity to design a truly exemplar sustainable building. The narrow footprint and atrium, which links all floors vertically, maximises natural ventilation. The stepping back of the floors towards the south and extensive roof lights maximise natural daylight in the building and direct sunlight in the courtyard while the acoustic ceilings unify the whole and provide the perfect acoustic environment.